Today I visited a second hand stuff and spotted Vintage Electro Acoustic guitar priced at £50. By Google I think it's a Vintage VEC500. Does anyone know anything about them? I'd give it a play in the shop and see what you think. Check for cracks and make sure the tuners all turn as they should etc. If all's well, you can't go wrong for £50. Even if you spend another £30 on a set up it'll be a cheap way to getting into acoustic. Cheers, Replicant. Just read that. I just want a cheap acoustic for strumming after a few beers. I'll have a proper look tomorrow. On closer inspection I realised it was left handed. Disappointed because it was absolute bargain. That's a shame, though i've not tried a Vintage acoustic, I have three Vintage electrics and the quality is superb!! I was told they were a part of Encore (Same style of fonts) but broke away from them!! Dragging up an old post or- Holy thread resurrection Batman!! I just bought two OM sized Vintage acoustics this week! 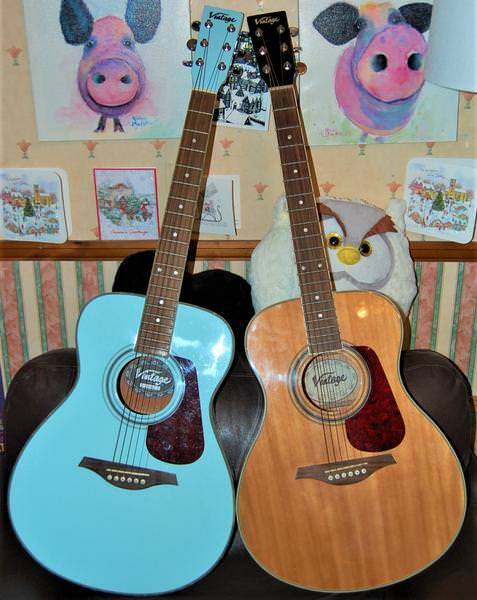 !, I got a V300 Nato/Spruce off Ebay cheap and then found a Baby blue one with mother of pear bindings cheap too!! Have to say, Even with ancient strings, They still sound very nice!! I have damaged my right shoulder at work and am finding it painful to have the arm hanging over a dreadnought after a few minutes so I thought i'd try a smaller body one and these are cracking little guitars and much more comfy for my injured joint!